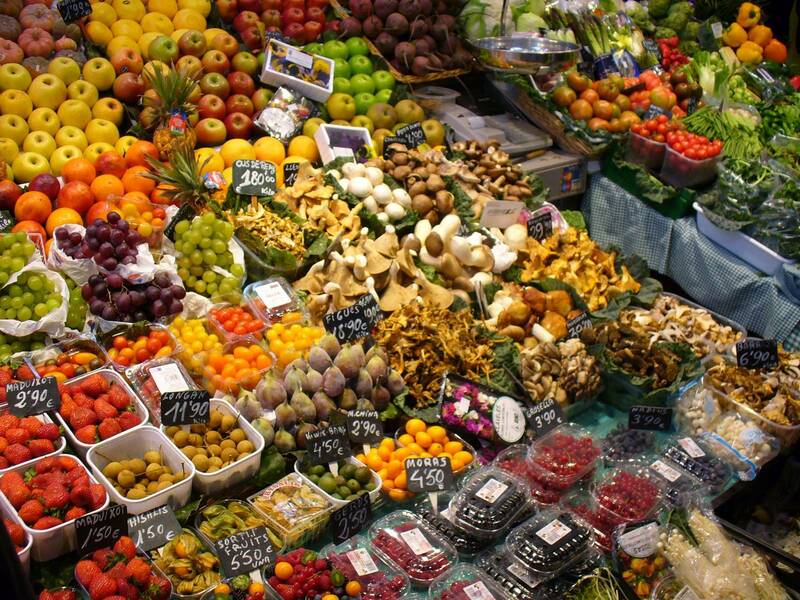 ‍An enticing produce spread in Barcelona, Spain. Did you know that the food supply in Los Angeles would run out after three days if truck and plane deliveries ceased? Or that if the Detroit region got just 20% of its fresh food from local sources, it would create more than 40,000 jobs? In a shaky economic climate, local food and products represent more than just a fashionable trend. Reinvigorating local economies is central to maintaining prosperity in our communities. Indeed, the recent explosion of popularity for public markets and farmers markets is a sure sign of people’s understanding that security depends on regaining control of their lives, communities and local economies. Not so long ago cities and rural areas were intrinsically linked: the urban food system was largely dependent on the production of farmers in the surrounding countryside. Every city had a “Market Street” where growers sold food out of wagons or trucks. Photos from the 19th Century and first half of the 20th Century depict massive public markets teeming with customers and farmers. Most cities also had a network of market gardens on the edges of town. Construction of the interstate highway system, designed in part to distribute food efficiently all over the country, but which also ignited suburban sprawl. Disinvestment and decline in cities as development rushes to the suburbs, resulting in economic and social disparities. Despite these issues, there is no question that these changes to the U.S. food system have accomplished their original goal of delivering ample and inexpensive food. Today, most American consumers do not have to worry about shortages of food, and can generally find what they want when they want it. But in the name of efficiency, low prices, and consumer choice, we have also eliminated one of the fundamental exchanges that have supported economies from the beginning of time: providing food products within local economic systems. This system of food distribution brings with it a specific set of problems. Huge inequities exist between wealthy suburbs and struggling inner cities and rural areas, which have become “food deserts.” This has led to an obesity epidemic in poor communities, and troubling overall health disparities. Reviving local food traditions and economies does not mean junking the existing food system, but embracing new goals beyond just cheap prices and a steady supply. This is plain common sense in a time when economic uncertainty and fluctuating energy costs could mean a sudden drop in food shipped from afar or a huge jump in prices. 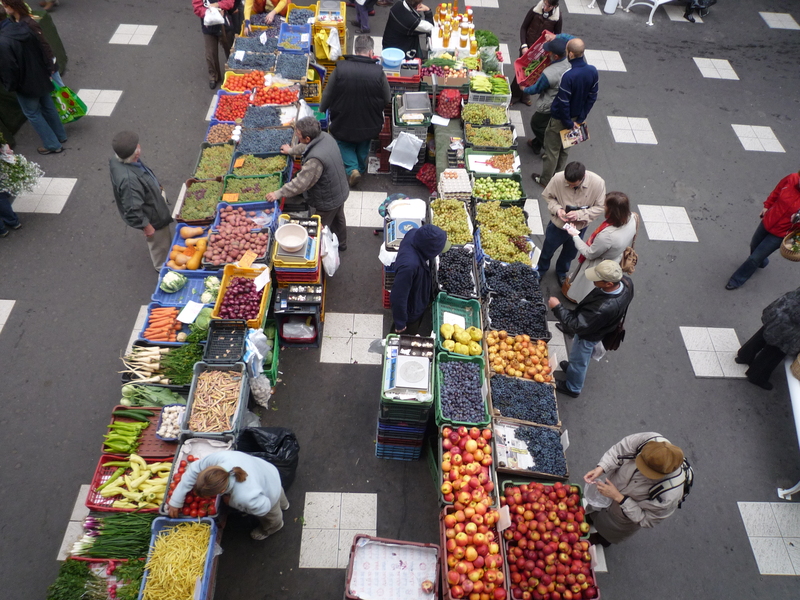 An aerial photo of a Bulgarian farmer's market. Changes in food distribution are already underway and this is evident in the exponential increase of farmers markets, the rebirth of public markets in many places, and the rapid emergence of the local food movement. Consumers increasingly want to know where their food comes from for reasons of nutrition and taste. They also see the benefits of investing in the local economy, rather than distant suppliers. And there's growing awareness that the lack of fresh, healthy food in low-income communities heightens many of the problems associated with poverty. Local economic revival goes farther than food. Through the Project for Public Spaces public markets program, we’ve seen thriving examples of craft, ethnic, flower, and even flea markets that boost economic development and provide real opportunities for community entrepreneurs. An excellent example is the annual children’s market held in the Netherlands on the Queen’s birthday, which brings families out to trade goods and socialize. Project for Public Spaces plays a key role in boosting farmers markets and public markets nationally. On top of our direct work with markets themselves, we have partnered with leading foundations such as Ford and W. K. Kellogg to provide grants to help local markets sustain their communities. Over the last three years, we have awarded nearly $3 million to market projects in 40 neighborhoods to transform local communities: reviving local economies by keeping dollars recirculating; boosting economic development that creates jobs and entrepreneurial opportunities for low-income people and immigrants; revitalizing neighborhoods and towns through the creation of flourishing public spaces; ensuring a supply of fresh, nutritious and safe food to everyone in a community; and promoting environmental sustainability. In terms of measurable, quantifiable successes, East New York Farms! has one of the most striking programs of all the PPS grantees. Their mission to organize a multigenerational and multicultural movement around local food systems and community economic development began in 1995 out of a community planning process hosted by the Pratt Institute. Since then, the East New York Farmers Market has evolved to include approximately 20 vendors and as many as 12,000 patrons per market season. 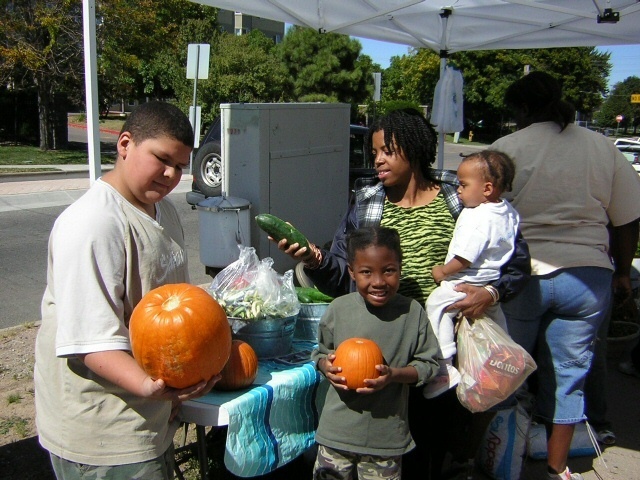 In their proposal, farmers market organizers discussed a desire to increase the patronage of residents receiving Farmers Market Nutrition Program (FMNP) coupons, create additional economic opportunities for community growers, and continue to foster a celebration of the neighborhood’s cultural diversity. 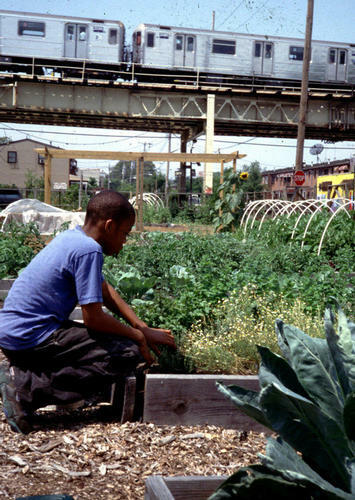 ‍The East New York Farms lie in the shadow of the elevated subway in Brooklyn, New York. Actual outcomes far exceeded the goals set forth in their proposal. In total, their community gardens and youth-run urban farms produced $18,000 in produce over the growing season. Combined with outreach efforts that brought 22 new gardeners (18 of which were immigrants) to supply the market and producer/vendor training programs, the market experienced a 20% increase in sales over the year. Nineteen cooking demonstrations were organized with the local WIC office, which contributed to a 24% increase in WIC coupon redemption. Additionally, the market experienced a 62% increase in Electronic Benefits Transfer (Food Stamps) transactions over the course of the grant cycle. Efforts to promote cultural diversity included translating marketing materials in five different languages and hosting regular events which included food, music, and dance. The Fairview Farmers Market, organized by Denver Urban Gardens (DUG), provides disadvantaged youth, in one of Denver’s poorest and most culturally diverse neighborhoods, the opportunity to run a farmers market, allowing them to develop entrepreneurial and leadership skills. In an effort to make the Fairview Farmers Market more sustainable, DUG wanted to increase the hours of the market and work with the neighborhood’s youth, engaging them in the operations of the market. To begin, they recruited new, young vendors from neighboring Fairview Elementary School’s fifth grade class. Market leaders also worked with PPS and their peer mentor to identify areas in which the market could grow. Following these discussions, the market partnered with Micro Business Development Corporation (MBDC), an organization dedicated to helping small businesses grow. Through MBDC, the youth were trained on pricing and packaging products. They were also trained on customer service, market set-up and design. Together with MBDC and market leaders, the youth crafted a message about community health and healthy eating in order to promote their market, and became “nutritional ambassadors” in their communities. The market experienced great improvement as a result. It became a place of community congregation, where over 200 people attended events organized by the youth. Most important, the market was a place where the youth could grow and learn. For these youth, several of whom suffer from or witness domestic abuse, the market is a place to regain a sense of confidence. The market encourages them to work as a team and allowed them to see the value of their work. As it grows, the Fairview Farmers Market continues to not only provide fresh produce to a low-income and culturally diverse neighborhood, but it continues to offer a much-needed, much-supported learning community. PPS believes the continuing expansion of farmers markets and public markets can become the foundation of revived local food systems that provide everyone in the community with wholesome food and economic benefits. While trends toward local vegetables, fruits and value-added foods can be seen almost everywhere, there are still big challenges ahead of us in creating an economic structure to sustain local producers. Even in Europe, which never went as far in the direction of large-scale distribution systems as North America, there is still an acute shortage of local dairies and meat processing facilities. In partnership with our Bay Area co-hosts and host committee, we are planning a conference that will leave an important local legacy as well. We will highlight the dynamic San Francisco region as a living example of the potential of successful public markets. Moreover, this conference is a unique opportunity for the San Francisco region’s market and community leaders to learn, to network, and to develop unique partnerships that will strengthen markets, communities and economies throughout the Bay Area. We hope to provide a timely and powerful experience that allows attendees to network, share ideas and brainstorm on creative solutions to assure that local markets remain a focal point of every community. Visit the Conference web page for more information. Donate to PPS now to help support Conference scholarship programs and defray operating costs! Contact PPS to set up a markets initiative in your community!